My friend Erin has been "begging" I post about these almonds. She gets frustrated with me because whenever she asks how to make them, inevitably she's met with the same response, "Oh you know...a little of this...a little of that." I'm not purposely being vague and there's no family recipe I'm desperately trying to conceal...it's just one of those little snacks (a staple in our house) that truly is... "a little of this...a little of that." Line roasting pan with foil. Toss almonds with olive oil or cooking spray until the nuts are well covered but not dripping wet. Place the almonds in a single layer on prepared roasting pan. 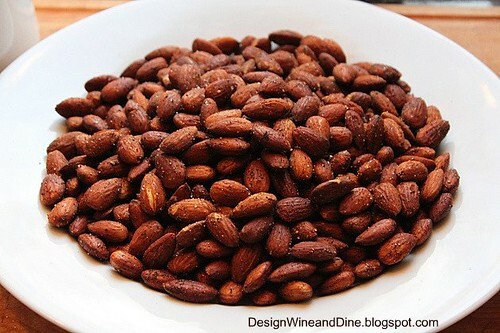 Roast almonds for 8-10 minutes or until the almonds are a nice darkish brown. Remove from the oven and let cool. (You should hear the almonds make a cracking noise every now and then). 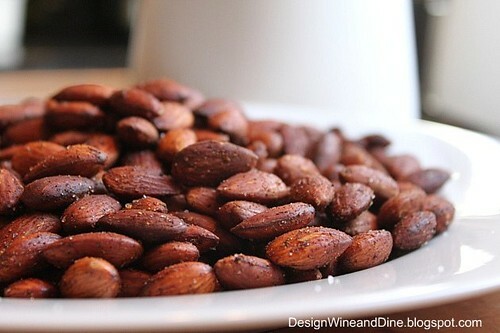 Once cooled the Almonds should be crunchy and packed with delicious flavor. Thats it. I'm getting some raw nuts today cause you're making me drool. And drool and laptops is a bad combo :) SO I have to protect my laptop by getting nuts & making these. ASAP! A staple in our house, too. Roasted pecans, too. Cindy puts 'em in different dishes like tuna and chicken salad, which I love. What a simple snack - they look and sound delicious! This sounds so delish and yummy, I have to save this recipe. Thanks for sharing. These look soooooo delicious! Would be perfect cocktail nibbles. As a fan of almonds, I need to bookmark this recipe. Your roasted almonds would be like crack-these look amazing. You could never just eat a handful. I agree with Angie above, these would be perfect cocktail nibbles. Sounds like what I put in my spiced pecans, and they are FABULOUS! When I roast nuts, It's whatever spice is in the pantry. It's a difficult recipe to write down. It's similar to asking a painter how did they create a particular shade of blue. My husband never says no to snacks like these one. This is a keeper! Geez, I don't think I'll ever want to eat plain old almonds again after seeing these!! YUM! I love a little this a little that recipes because they mean that I can just use whatever's sitting in my cabinets! Mmm almonds. Always delicious. Hot paprika makes the roasted almonds even more spicy.